I arrived in Moscow a day before conference participants were to move into the hotel, and so stayed with a local family—Lena, a close friend; her boyfriend; and his 16 year old daughter. At 23 Lena already has 5 years of work experience as one of the top fashion journalists for the foreign press in Russia, as well as a degree at the department of journalism at Moscow State University, arguably the top university in the country. They both work late hours (her boyfriend is also in the fashion press), so when I arrived in the afternoon, the daughter was waiting with tea, cookies, and conversation. This family is representative of the new generation of Russians, and how much life has changed for many Moskvichi in just a few years. Lena is a young Russian who is 'making it,' working hard and moving quickly to the top of the world of international fashion journalism. Both she and her boyfriend have excellent fashion sense and taste, live in a very nice apartment not far from the center of Moscow, and participate in the café lifestyle that has come to replace the old Soviet lifestyle of socializing by sitting in the kitchen, drinking tea and discussing politics and 'dusha' (the Russian spirit). Lena and her boyfriend could be a pair of sophisticated, highly-educated socialites anywhere in the world; Lena has a particular love and fascination for New York, and dreams of life there one day. When they came home from work, we stayed up late into the night, enjoying fresh watermelon and bad beer, and swapping stories from our lives in the past year. The next morning, I left the apartment early, bought a newspaper for the metro (more to appear less conspicuous to the police officers to save myself the trouble of explaining why I hadn't registered with the police yet), and headed in town to meet Olga, my former landlady and also a close friend. The metro hasn't changed at all in the time that I've been coming back and forth to Russia (since 1999). It is still constantly packed with a lot of people anxiously pushing, shifting, and shuffling into position to ensure that they actually manage to get off the train at their stop. I tried to read my newspaper by positioning it on someone's back, but couldn't unfold it, so had to settle for the headlines of Moskovsky Komsomolets. Typical fare: "Elderly woman finds human finger in doktorskaya [i.e. meatless] sausage," "Moscow faces shortage of watermelons," "Pugacheva goes on a pension of 1000 rubles ($30)." I got off at Mayakovskaya, stopped at a grocery store to buy some bacon and coffee, and went up to see Olga. Olga is an artist, and fits the Russian idea of 'khudozhestvennaya lichnost ' ('artistic personality'). She lives in a small apartment in the very heart of Moscow with her 13 cats, and complains how the cats have the run of the place (which is, indeed, the truth). The 13 cats have formed a society of their own in the Mayakovskaya apartment, and are constantly fighting for supremacy in that society, which seems to be for a seat on the top of the coffeemaker. Each of the cats has a personality of its own, from Lorik ('samy dobry no samy glupy') to Pusik (who is constantly dirty from being God knows where) to Bocharev ('nash gurman') to Masha (who lives, eats and sleeps in a cabinet above the sink, which she can't leave for fear of the other cats). The air in the apartment is constantly filled with hair and the sound of the cats going about their daily business. The cats somehow figured out how to open the refrigerator, so now Olga bungee-cords it shut. The cats have free reign of the apartment complex and occasionally roam to other floors, which the neighbors don't seem to mind (the building was constructed to house Moscow's artists, so it's filled with personalities who are more or less forgiving of each other's eccentricities). When I lived in Moscow, I rented a nearby apartment that Olga inherited from an elderly woman that she used to take care of. Every Sunday morning, Olga would call me around 9AM (regardless of what time I got in) for breakfast: usually bacon, bread, and a liberal amount of cognac. Olga loved her cats dearly, and dreamed of the day that she could afford a dacha with two floors: one for the cats, and one for herself. In any event, once I left Moscow, she moved into the apartment where I had been living, and left the other apartment to the cats—the true masters of her apartment. While Olga's only daughter was very much a moskvitchka—very cosmopolitan, fashionable, and ambitious—Olga reflected her own upbringing in provincial Ulyanovsk, and was therefore more interested in the simpler, deeper aspects of life, was a great conversationalist with just about anyone, and genuinely cared for the unfortunate and forgotten. When I arrived at the apartment, Olga was having coffee with a mutual American friend of ours, who was off on her way to work. The minute that she left, Olga turned to me and embraced me enthusiastically, and we began to cook up some bacon and catch up in earnest. Olga was excited that I was finally living back home in the US, concerned that I wasn't married yet, and upset that I hadn't been back to Moscow more frequently. She then was moved to tears when she told me how one of her favorite cats, Zakatin, jumped from the apartment balcony to his death (the third cat to pass away this way). Olga found a new cat to take his place about a week later, to bring the total back up to 13. She then got very angry at how the pension system had changed from in-kind benefits (such as free housing and transportation) to a check sent out by mail, which frequently never makes it to its destination. After breakfast, Olga and I walked to the Hermitage gardens, which were closed to the public because a bank had rented it out for a private party. Olga saw this as commentary on new Moscow life, noting that the park is public property and the bank has no business excluding the public from enjoying it. We then walked past the eyesore of a casino on Pushkin Square and sat down and watched the public go by, until I had to go and meet my former boss for lunch. The writer, the young man to your right, sang with the tenors in Yekaterinburg's Bolshoy Khor. 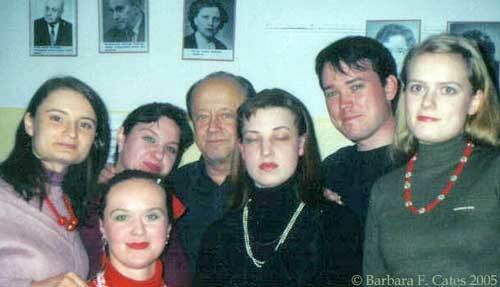 Here he poses in 2003 with the director, Vadim Petrovich, and a few sopranos and altos. That evening I met up with Greg and Yulia, two of my closest friends from my time in Russia. Greg is working with the UN, but is a linguist at heart, and he lives with his charming girlfriend Yulia in a small but cozy apartment in Fili. We met at a Georgian restaurant, where we first had to discern where the live music would be (an important question—so that you can be as far as possible from its source, in this case a loud, possibly drunk Georgian with a synthesizer). The restaurant had expanded and now had outdoor seating in little thatch-roofed huts, strangely out of place immediately next to six lanes of traffic on Komsomolsky Prospect. Greg confirmed what I already suspected, that not a lot had changed in Moscow, and even described the cultural and economic scene as 'stagnating.' Yulia was excited to begin her new job but was knee-deep in Russian bureaucracy establishing her organization with the tax police, no small feat indeed. Both love Russia, its history, culture and people, but were concerned about the direction that the country was headed. The news channels were busy with their top story: Putin, unnaturally dressed in a checked plaid shirt, offering words of father-like guidance to the Nashi movement. After a daylong conference, I was on my way home without even adjusting to the time difference. In general, my impression of Russia during this trip was of a country that has not developed much since I left over a year ago. The general opinion of people that I spoke with was that Russia is becoming politically more authoritarian in subtle ways, while the wealth (or poverty) of most people has not grown despite rising oil prices, which have driven the economy's expansion. More than ever it is apparent that the divide between rich and poor continues to grow at a fast pace, and many people continue to view government reforms with a great deal of skepticism. Still, it was wonderful to be back in Moscow, a city that I love with friends that I cherish. Last year when I was leaving Russia after finishing a job in Yekaterinburg, the driver taking me to the airport told me: "Russia is a disease with no cure. Once you have caught it, you will be drawn back again and again, fascinated by its irrationality and unpredictability." This seems to be true, no matter how intolerable and inconvenient it may seem at times. Eventually I always miss Russia in a way that only the Russian language can adequately express with the word 'toska.' For that reason, while I truly hope for the sake of my close ones that life improves for the Russian people, part of me is always worried that in its modernization and westernization it will lose that element of irrationality. I hope to return to Russia for New Years. In the meantime, I'll have to settle for Russian literature, occasional overseas emails and phone calls with friends, and fond memories of my time spent there.